Space Dog Alfred is not part of the #mirrorofeternity series and it is aimed at a younger audience. It is the book which has had most success in the difficult business of getting libraries ,which have no money to spare, to buy copies. 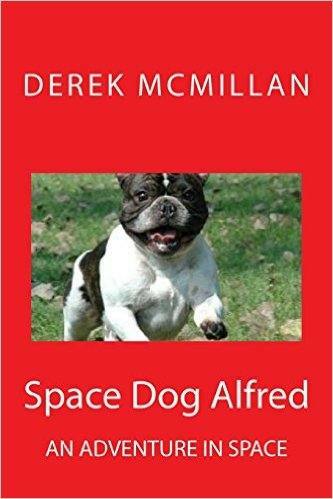 The book tells the story of a French Bulldog who ends up going into space with Finbar Cool, a very dodgy street trader and uncle to Tom and Seren, the twins who accompany him. Finn brings his daughter, Abby, along too. Tom is delighted about Abby tagging along, Seren not so much. On the planet they visit there is a group mind which is shared by Gai - sentient tree-like creatures - the Veck who are humans but have mastered unpowered flight and the people of Ardin who are small but perfectly formed. They worship death. The group mind is not shared by creatures known as the Gnarl who are warlike and largely live underground. It is an adventure story in which the powers of all the characters are tested to the maximum. Abby, captured by the slovenly Veck, realises that her selfishness is holding her back. Seren eventually comes to realise that Abby can change for the better. Tom finds out that he really doesn't know everything. Finn realises the futility of war. Alfred's bravery and his powers of perception make him into a hero. Like all French Bulldogs, he has the power to understand what humans (and other creatures) are thinking. In the end good triumphs over evil. The heroes succeed in averting a war which would have cost thousands of lives. In doing so they also introduce the gnarl to the joy of storytelling. They prove that it is possible to win a battle by surrendering.